The 12 signs of the zodiac are displayed on this dazzling design that will give each envelope you mail a celestial look! 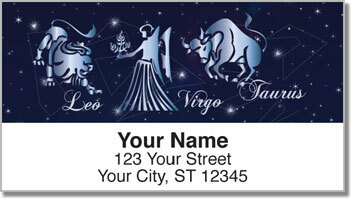 Each of the individual return address labels in this set features three different signs of the modern zodiac set against the background of a star-filled sky - from Gemini twins to Leo the Lion. It's the perfect selection for those who believe astrology really does help guide us through life. 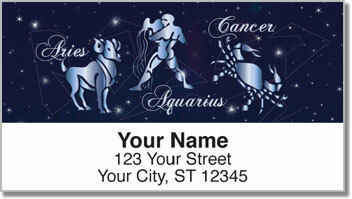 Zodiac Symbol Address Labels from CheckAdvantage tell everyone on your mailing list that you believe in destiny! Here's hoping the stars align for you! 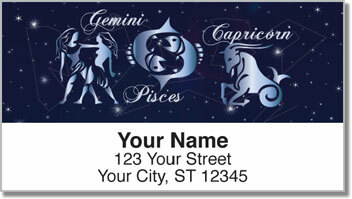 Order your very own self-adhesive Zodiac Symbol Address Labels today! 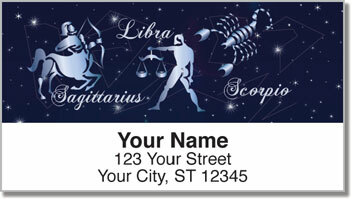 This astrological style is also available in matching personal checks.